Bring $5 cash for the tour. This event is still active after the storm. We plan to proceed as planned. Fri. 8:15 am update. Explore and Experience California History! Gilman Historic Ranch and Wagon Museum preserves, celebrates, and interprets the history of late 1800’s California, from the Cahuilla Indians to the exploration and settlement of southern California and the San Gorgonio Pass. Explore a piece of the past at the Gilman Ranch and Wagon Museum. Once just an adobe hut, then a stage stop and general store and finally an expansive ranch house, the Gilman Ranch site remains today a storybook of the past. 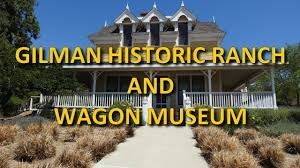 Now also home to the largest public collection of wagons, buggies and stagecoaches in southern California, this site is a must-see for locals and tourists alike. There is a 2 mile hike out and back to the top of the hill overlooking the Banning Pass. Wear good hiking footwear and bring water if interested in doing the hike. New Meeting Location: 9:20 AM Meet at Dollar Tree at Sunrise/Vista Chino MAP for 9:30 AM departure. Carpooling is encouraged and may be available if offered by a driver. You are responsible for arranging you own transportation or ride share. Arrive a few minutes early for briefing and carpooling. When carpooling, ride with someone that either plans to attend the Sizzler lunch or not. Distance is 24 miles to Gilman Ranch from here. Be kind you your ride share driver and share travel expenses. Or meet at 10:00 at the Gilman Ranch in Banning. What to bring: $5 cash for tour (no credit cards). Members may register 2 guests for this event. Surrounded by cottonwoods and watered by three natural springs, the present Gilman Ranch site has attracted people throughout time. The superb location of this canyon with an exceptional food and water supply offered a prime habitation site for the Cahuilla Indians in this area. Later, under the Spanish government, this site was originally part of the San Gorgonio Rancho, the farthest outlying cattle ranch of Mission San Gabriel. Entrepreneur Newton Noble. lived in the adobe, converted it into a stage stop and opened the first post office in the San Gorgonio Pass in 1868. Noble’s property lay along the Bradshaw Trail, a heavily traveled route from Los Angeles to Arizona during 1860s and 1870s. The trail was originally part of the network of Indian trails that William D. Bradshaw, miner and freight driver, learned from Cahuilla and Maricopa Indians. The Bradshaw Trail became an important communication route for federal troops as they expanded control over Arizona and New Mexico. the last great western manhunt of Willie Boy, a Paiute Indian who wished to marry a young woman named Carlotta against her father’s wishes. She and her family were camped at the Gilman Ranch working on the fruit harvest when Willie Boy killed her father and escaped with her. 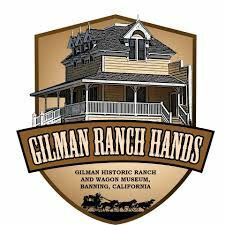 Today the Gilman Historic Ranch and Wagon Museum preserves, celebrates, and interprets the history of California, from the Cahuilla Indians to the exploration and settlement of southern California and the San Gorgonio Pass, including the homestead ranch of James Marshall Gilman. Come and explore your gateway to the western frontier.